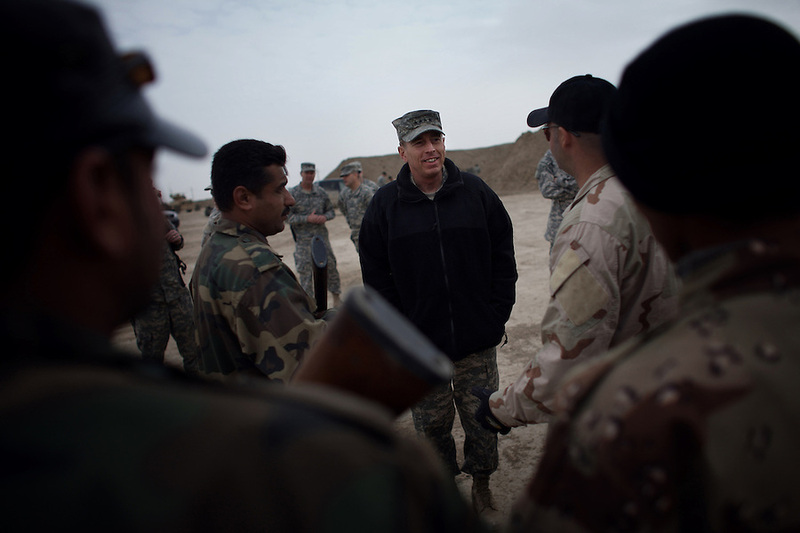 Iraq commander General David Petraeus inspects the work of Army Special Forces soldiers tasked to train potential Iraqi S.W.A.T. police officers at Camp Echo in ad-Diwaniyah. The visit was took place during a visit by Petraeus - and his immediate subordinate Lt. General ? Odierno - to attend a change of command ceremony for rotating Polish units in ad-Diwaniyah, a majority Shiia city in southern Iraq. The incoming Polish unit will be the last Polish force to serve in Iraq after Warsaw announced plans to withdraw its troops in the fall. The Polish have third largest national contingent serving in Iraq after the US and Great Britain.raq commander General David Petraeus inspects the work of Army Special Forces soldiers tasked to train potential Iraqi S.W.A.T. police officers at Camp Echo in ad-Diwaniyah. The visit was took place during a visit by Petraeus - and his immediate subordinate Lt. General Raymond Odierno - to attend a change of command ceremony for rotating Polish units in ad-Diwaniyah, a majority Shiia city in southern Iraq. The incoming Polish unit will be the last Polish force to serve in Iraq after Warsaw announced plans to withdraw its troops in the fall. The Polish have third largest national contingent serving in Iraq after the US and Great Britain.